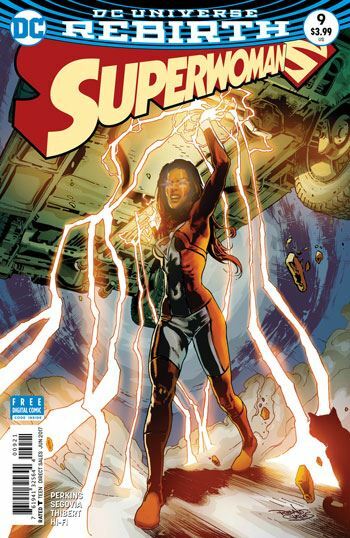 Lana Lang has lost her powers as of the latest issue of Superwoman, and is none too keen to get them back. K. Perkins scripts this issue, and though it’s a decent enough tale, the story just doesn’t seem to have the crazy charm and chaos that Jimenez’s issues had. But that might well also be because of the plot. 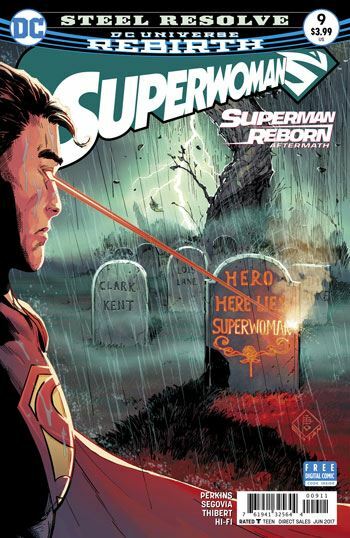 Lana emerges from the Kryptonian battle suit, her life saved, but her powers drained. She goes through the issue re-adjusting to life as a normal woman, and feeling conflicted about her loss of a superhero identity. John Henry Irons just can’t seem to say or do anything to make the situation better for Lana, so he calls in Superman. Most of the story consists of the old Smallville friends talking about Lana’s feelings and her situation. Dramatic action is added as the Atomic Skull joins Maggie Sawyer’s police force, and has a hard time fitting in, but is so eager to prove himself that he jumps the gun when dealing with Remnant. There are good moments in the issue, some scenes I quite enjoy, but on the whole it felt flat to me after the first eight issues. As I said, I am not sure right now if it was the writing, or if it was simply the story. It seems like everything in the DC universe is right on the edge at the moment, built up for the resolution of Rebirth, but not taking that final step.